Arizona Food Allergy is proud to partner with participating dentist's ACROSS THE ENTIRE STATE OF ARIZONA for AFAA's Sweets for Soldiers. In conjunction with Halloween Candy Give Back, Operation Gratitude, Arizona Food Allergy, and your participating Arizona dentists...we are keeping the FUN in Halloween for food allergic individuals. In addition, you get to help our soldiers deployed overseas! - Give food allergic individuals a sense of pride, accomplishment, service and community by giving to those that serve our GREAT country! 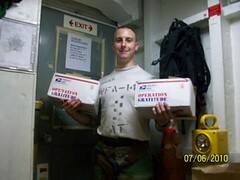 - The soldiers that put their live's on the line for each and every one of us...get little goodies sent their way! - The dentists get great publicity and set an example to the community. CHECK WITH YOUR LOCAL PARTICIPATING DENTIST (SEE LINK BELOW) TO CONFIRM THE DATE(S) FOR DROP-OFFS. EACH DENTIST OFFERS A DIFFERENT "GIVE BACK" INCLUDING $1/LB CANDY TURNED IN, SILVER DOLLARS, $2 BILLS, AND MORE! DATES TYPICALLY BEGIN NOVEMBER 1ST EACH YEAR, ENDING ABOUT 7-10 DAYS AFTER. Find a Participating Dentist Near You! Just click on the picture to the left to be directed to the Halloween Candy Give Back site. Once there, just enter your Zip Code in the upper right hand corner...it's that easy! There are TONS of dentists participating around the great State of Arizona, from Kingman to Tucson, and beyond! If you are a dentist who'd like to register for this wonderful multi-beneficial program CLICK HERE to be re-directed. Operation Gratitude seeks to put a smile on a service member's face & express our nation's appreciation by sending care packages & letters personally addressed to U.S. Military deployed in harm's way and and Wounded Warriors recovering in transition units. 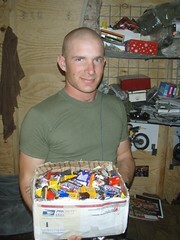 EMAIL US A PICTURE OF THE CANDY YOU TRICK-OR-TREATED AND DONATED TO SWEETS FOR SOLDIERS! If you'd like to download a copy of our AFAA'S SWEETS FOR SOLDIERS flyer CLICK HERE. You can use this flyer if you are a participating dentist, or to "pitch" this program to YOUR dentist!